Of course, there are jaw-dropping moments of awesomeness, amazing views, blue skies, sheer drops, dramatic cloudscapes and thundering cascades. Not to mention the fantastic feeling of achievement when a particularly difficult or exhausting summit is bagged. But (and this surprised me) some of it is less than awesome. For example, the unpredictable weather that makes a mockery of well considered plans. Climbing a hard-won fell only to find that the summit is swathed in mist, depriving the walker of a rewarding view. The shin-deep bog that lies between this fell and the next. The uneven arrangement of fells, meaning that some days are filled with awkward logistics… Well, you get the idea. But, of course, that’s the whole point of a challenge; it has to be… challenging. Not only that, but the contrast between rough and smooth actually accentuates the most sublime moments. You know when you’ve earned the good ones because you’ve also done the miserable ones. 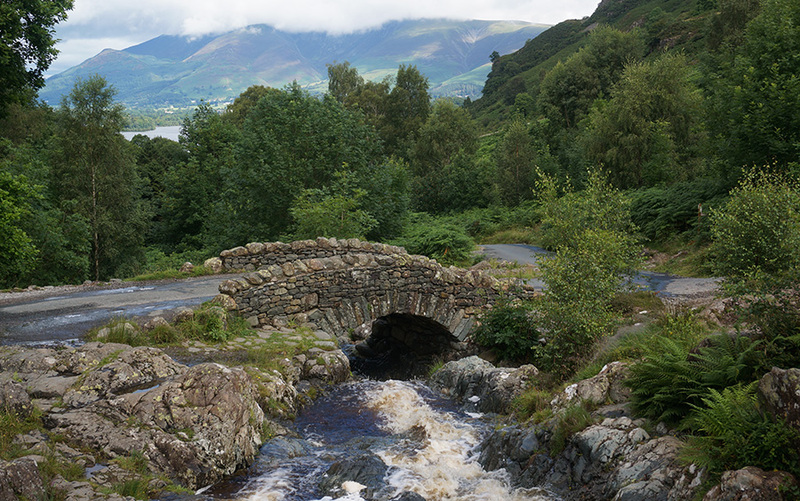 My latest visit to the Lakes was a healthy mix of both rough and smooth. There were many positives: I completed the Eastern Fells with an ascent of Seat Sandal from Dunmail Raise and a lovely walk alongside Raise Beck. I made a good start on the Central Fells, bagging more than half of them in 3 days. 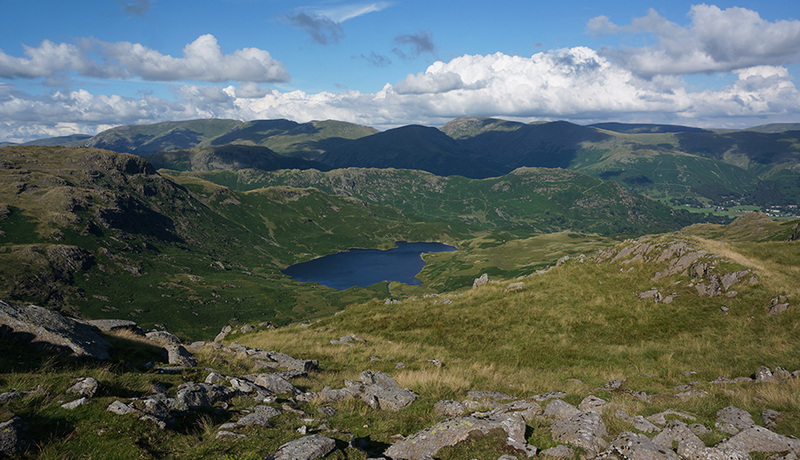 I set a new personal record of 8 Wainwrights in one day on a ten and a half hour, sunny walk from Grasmere. The views northwest from High Raise and south from Sergeant Man. And the not so good bits: Being rained off for a whole day (in July for heaven’s sake!). Losing three days of photos when my SD card died (I’ll be copying all photos at the end of each day from now on). The boggy ground between Bleaberry Fell and High Seat. 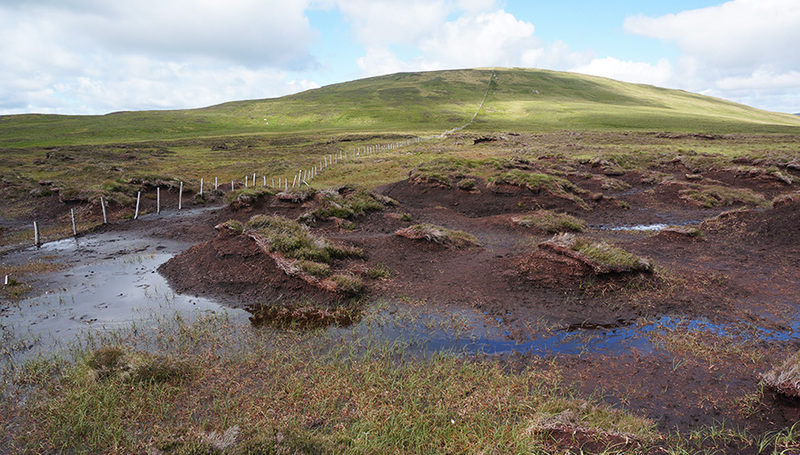 The even boggier ground between High Seat and High Tove (The Pewits sound like such a nice family but in fact it’s the name of a morass). Oh, and High Tove – a fell? Really? I guess Wainwright must have felt a walker on that north-south ridge needed some consolation after trudging through 4km of bog. Despite all of this, I’m so glad I’ve done the northern, Central Fells (and that I’ll never have to do them again). On the other hand, I visited places that I definitely want to return to. And that’s the beauty of this challenge; I get to see it all, good and bad. And once it’s complete, I’ll know the best places to go, the best walks to do and the best views to see. I’m already storing up some favourites. For example, I’d love to walk the full length of the Helvellyn ridge from Clough Head in the north to Dollywaggon Pike in the south. One of the key things I noticed on this trip was the change in flora after only a few weeks away. When I visited in June, it was the Foxgloves that stood out most prominently and although they are still in bloom in July, the real star of the show (for me) was the Meadowsweet (Filipendula ulmaria). Just about every watercourse and damp verge was frothing with its beautiful creamy-white blooms. Sadly, all my Meadowsweet photos were lost when my SD card failed but I confidently predict that I’ll be back next July to snap some more. Sunday I’d planned a walk from Patterdale to take in Arnison Crag and Seat Sandal via St. Sunday Crag but it rained most of the day. 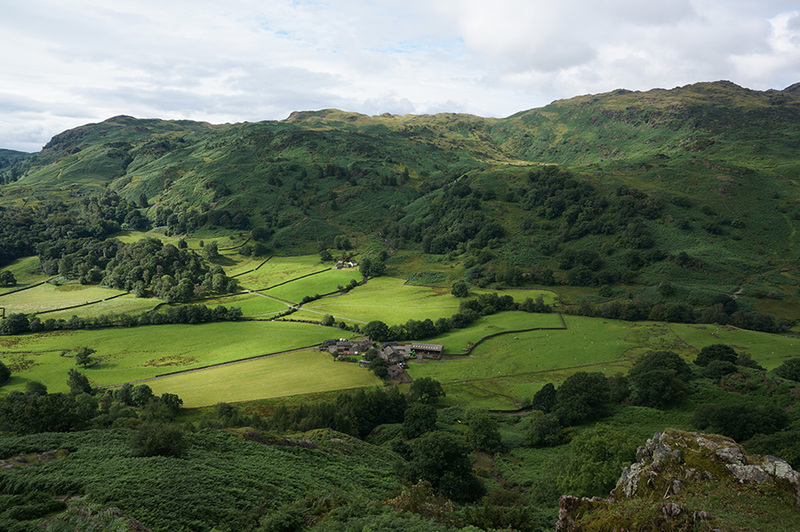 It eased off later in the afternoon, allowing a quick ascent of Arnison Crag. Monday I did the Mell Fell Medley, taking in Gowbarrow, Little Mell and Great Mell. I didn’t care much for the two Mells but Gowbarrow was a great walk, starting from the Aira Force car park and taking in the waterfall on the way. A nice, easy walk that would be a great half-day outing even for young families. Tuesday was all about finishing the Eastern Fells with Seat Sandal and starting the Central Fells by picking up some of the outlyers. I figured doing this would mean I could look forward to the longer ridge walks in better weather, so I picked off High Rigg and Raven Crag. Wednesday I took on the northern Central Fells and got wet feet. On the map, it looks like boggy ground is peculiar to the Central Fells – I’m hoping that’s the case. Thursday was the lost day – it just rained and never stopped. Friday was by far the best day of the week, a round from Grasmere, loosely based on Walk 21 in the Vivienne Crow book but adding Steel Fell, High Raise and Silver How into the mix to total around 14 miles in excellent weather. 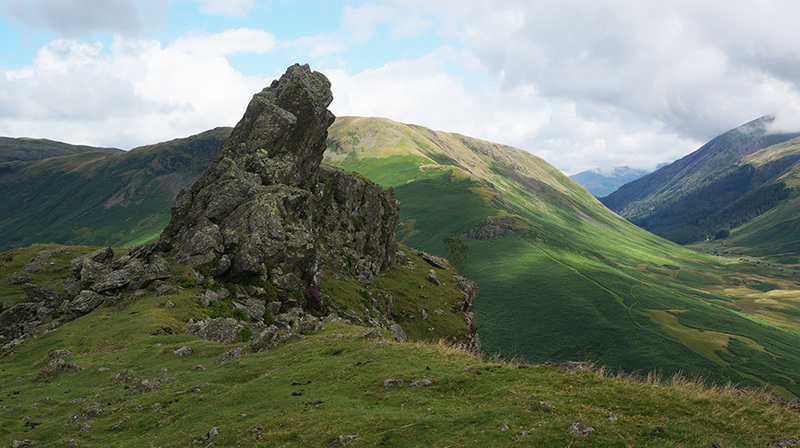 I have to admit that I didn’t manage to climb to the top of the rock pinnacle at Helm Crag. There had been a short shower just before I arrived and the rock surface was very slippery. Plus, there was no one else around. With a sheer drop on the other side, I decided caution was probably the better part of valour. I’m sure I’ll return another day to complete that small task. * Not a Wainwright but is included in Mark Richards’ guide. 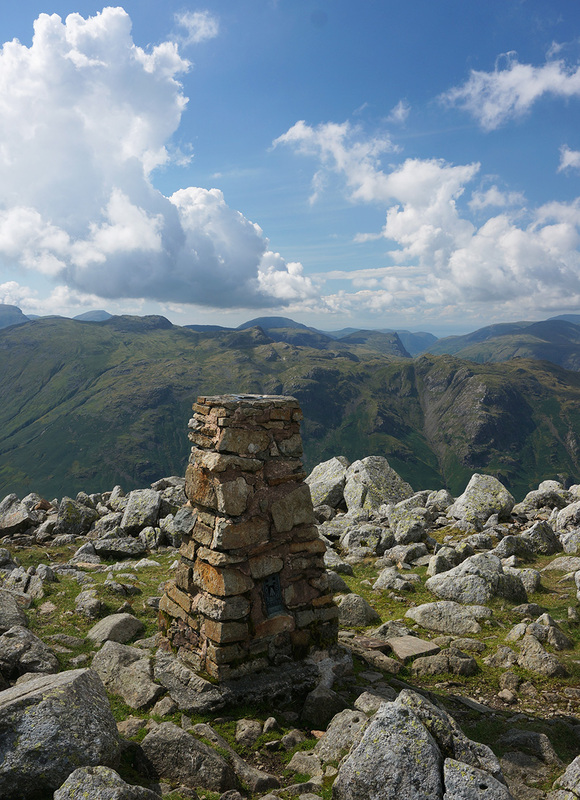 That completes all of the 35 Wainwrights in the Eastern Fells and 15 of the 27 in the Central Fells, leaving just 164 overall. When I began this challenge, last year, I just used the most convenient day sack I had to hand but it very quickly became apparent that a good backpack is probably the single most essential tool for the keen hiker. Through all of the walks this year I’ve been using the Futura 28 and found it to be just about perfect for my purposes. Better still, I got it for the bargain price of £40 in the Deuter end of year sale. Full price is more than twice that. I particularly like the air-flow system (no more sweaty back) and the dual compartment arrangement (lower compartment for walk essentials and upper for day stuff like lunch). I’m a fan of cotton T-shirts and so, naturally, I wore cotton when I began this challenge but it became clear that cotton was not an optimal material to wear for this sort of activity. Specifically, when it gets wet (either from sweat or rain – or both! ), it stays wet. So I’ve been wearing Rohan’s Element T tops on this trip and very pleased with the result. Feels like a cotton T-shirt but performs like a technical top with excellent wicking. A bit pricey for a T-shirt but worth it for the comfort.